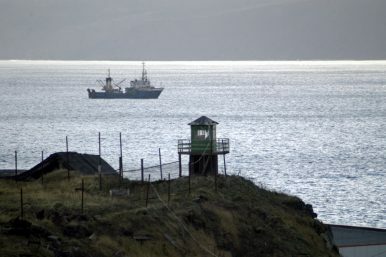 In this November 2005 file photo, a Russian border guards' tower is seen on Kunashir Island, one of the disputed Kuril Islands that are claimed by both Japan and Russia. Japan has officially logged a protest with Russia over the construction of four barracks on Etorofu and Kunashiri, two islets that are part of the disputed Southern Kurils known in Japan as the Northern Territories, located off Hokkaido in the Sea of Okhotsk in the Northwest Pacific. The protest was made through official channels by Japanese diplomats in Moscow on December 19, according to Chief Cabinet Secretary Yoshihide Suga. TASS news agency revealed earlier this week that the Russian Ministry of Defense (MoD) plans to move troops into the newly constructed barracks in the coming days. Furthermore, the MoD plans to proceed with the construction of facilities for armored vehicles. The recent military buildup—Japan’s MoD estimates that Russia has over 3,500 troops stationed on the disputed islands—comes weeks before an official meeting between Japanese Prime Minister Shinzo and Russian President Vladimir Putin in January. The two leaders agreed in September at the Eastern Economic Forum in Vladivostok, Russia to step up talks to resolve this ongoing territorial dispute and conclude a peace treaty. Abe and Putin have met 22 times to discuss the sovereignty status of the disputed Southern Kurils/Northern Territories with Japan repeatedly rejecting Russia’s offer to settle the dispute with the return of the two smallest territories of the chain, Habomai and Shikotan as Tokyo considers all four islands to be part of its sovereign territory. Notably, almost every bilateral meeting between Japanese and Russian leader over the past years has been preceded by news of ongoing Russian militarization of the islands. The Russian Navy has also been considering establishing a permanent naval base for its Pacific Fleet on one of the islands. Furthermore, the Russian MoD announced that it will deploy an army division there. Additionally, Russia stationed anti-ship and missile defense systems on the disputed territories in 2016. Recent Russian military activities are partially due to Russia’s concern over the procurement of two U.S.-made land-based Aegis Ashore ballistic missile defense batteries by Japan, which Moscow fears can threaten the strategic balance in East Asia. Another probable reason is that Russia intends to bolster its position vis-à-vis Japan during upcoming talks by using the additional troops as bargaining chips to be taken off the table at an opportune time to maintain the diplomatic illusion that Russia is interested in resolving the territorial dispute. However, there is no reason to believe that Russia is interested in changing the current status-quo of Russian control of the Southern Kurils.